It takes only 1 1/2 to 2 pounds of pears to make a Julia Child pear tart, as in "Mastering the Art of French Cooking, Vol. 1." But it takes 10 to 12 pounds to make a single, slim. 375-milliliter bottle of Brandy Peak Distillery's pear brandy. And it takes 10,000 pounds of luscious fruit to make enough brandy fill a 100-gallon barrel. Sipping this fragrant elixir, therefore, is like savoring pure pear essence. It's not sweet but clean, clear and dry, with the warming effect you get from a fine Cognac. Pears are plentiful in Oregon, where Brandy Peak is located. That's lucky for David Nowlin, who started this micro-distillery in 1993 with his father, R.L. Nowlin, who has spent many years in the distilling business. It's located on a forested site outside of Brookings in the southern part of the state. Because Oregon allows tasting rooms for spirits, I could sample the line. And I was so en chanted with the brandies that I bought three. They're in the photo above, along with a blackberry liqueur. Nowlin says it's hard to make good pear brandy. 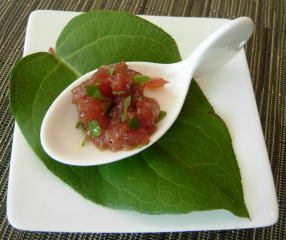 The challenge is to get the correct balance between flavor and smoothness. The pears, yellow Bartletts, are taken from cold storage to ripen outside. Then they are pureed, fermented with yeast and distilled. Most commercial spirits are made with continuous stills, but Brandy Peak uses wood-fired copper pot stills which, says Newlin, are "basically a coffee pot with a pipe coming out the top." Rustic as they may seem, they yield a finer product than continuous stills. The distilling equipment, which his father designed, looks like some venerable antique contraption. The temperature gauge is 90 years old. But the marcs, grappas and brandies that emerge are elegant. The aged pear brandy spends four to five years in a solera system of barrels crafted from Oregon white oak and French and Hungarian oaks. A natural pear brandy spends no time in oak. Brandy Peak also produces marc brandies from varietals such as Pinot Noir, Muscat, Riesling and Sauvignon Blanc. A marc brandy is distilled from grape pomace. An aged Pinot Noir marc spent eight years in Oregon white oak. Oregon is famous for Pinot Noir, and the grapes for this brandy came from Cave Junction in the Illinois Valley, about 75 miles from the distillery. Grappa, which is the Italian word for marc, is based on a proprietary blend of varietals. In response to customer feedback, the Nowlins added a blackberry liqueur made from wild berries, some of them grown on the property. They also produce a traditional grape brandy that is aged in Limousin oak. In the tasting room, you can pick up brandy recipes, including Mrs. Nowlin's Frozen Brandy Pie and a cocktail that represents Oregon's natural attractions. Called the Oregon Rain Drop, it's composed of a crushed mint leaf (representing the minty aromas of the Oregon rain forest), a pinch of sugar and 1 1/2 ounces ofpear brandy shaken with ice cubes made of Oregon rainwater. This mixture is poured into a glass lightly rimmed with salt and topped with a dash of whipped cream, which stands in for sea foam (the distillery is not far from the coast) and a cherry. The brandies are sold at the distillery, at liquor stores in Oregon and at a few places in northern California. For locations, check the website, www.brandypeak.com, The aged pear brandy can be ordered through BevMo, http://www.bevmo.com. Brandy Peak Distillery is located at 18526 Tetley Road, Brookings, OR 97415. Tel: (541) 469-0194. The tasting room is open Tuesday through Saturday from 1 to 5 p.m. from March 1 through the first weekend of January. It's embarrassing to admit that I didn't eat a hamburger for years. I've been oblivious to the show-offy, high-priced burgers around town. I haven't even eaten the famous burger at Father's Office in Santa Monica (or at its new branch at Culver City), although I know Sang Yoon, who started that business. Sang is a great chef, and not just of burgers. He cooked a marvelous Korean lunch for me when I was writing about such food for the Los Angeles Times. The closest I've gotten to his burger, though, was hearing classmates rave about it when I was studying Spanish in Guanajuato. That's how far its reputation has spread. But now, at last, I have eaten a hamburger. And a very good one, designed by a chef. This happened in Oakland in Southern Oregon. 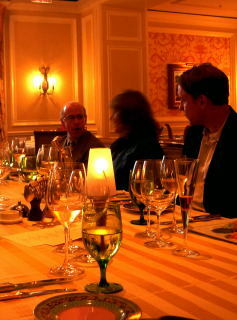 After a winemaker dinner there, I met the chef, Jeffrey Parker. That night, Parker had put together an ambitious menu based on Oregon foods. A couple of examples: cedar-planked wild Oregon river salmon with blueberry glaze and peppered bacon on zucchini tomato lentils. And a sesame tempura Anderson Ranch lamb chop accompanied by panko-coated lamb Salisbury, braised cranberry cabbage, polenta and a mint fig glaze. But his heart apparently lies elsewhere. "A burger will be my signature," he told me, a burger made with grass-fed beef from the Willamette Valley in Oregon. Pure and splendidly natural, it is, he said, "the world's best burger, a half pound of ecstasy." And so I returned to Oakland to eat that burger. Tolly's has an old fashioned soda fountain and ice cream parlor that opens into the restaurant, and the burger is on the fountain menu. It comes in seven styles, ranging from the Natural to the Kona with shaved ham, pineapple, Cheddar and Hawaiian dressing. You can have it on a bun or on a green salad, which is not my idea of a burger but probably appeals to dieters. The Bacon Cheddar sounded pretty good, with crisp house-peppered bacon and melted Cheddar, but I wanted no distractions, and so I ordered the Natural. It was a fine burger, half a pound of beef on a locally-baked potato bun, accompanied by a kosher dill pickle, sliced tomato and red onion, lettuce, a little cup of catsup and handcut seasoned cottage fries, made with Northwest-grown Russets. When Parker is there, he makes roast pepper ketchup. Otherwise, the kitchen sends out classic bottled ketchup, which is more in line with tradition. My Natural (with bottled ketchup) was plain and totally satisfying, no fancy touches needed or wanted. There couldn't have been a better choice to break my burger fast. The Natural burger is $9.99 at Tolly's Restaurant and Soda Fountain, 115 Locust Street, Oakland, OR 97462. Tel: (541) 459-3796. Other burgers are $10.99 (The Classic Cheese Burger) to $14.99 for the New Yorker, with corned beef, sauerkraut, Swiss cheese and spicy Russian dressing. I f I weren't already booked up for Thanksgiving dinner, I would love to go north to eat at Summer Jo's. This is just a fantasy, of course, because Summer Jo's is too far away for a quick trip on Thanksgiving day. It's in southern Oregon, near Grants Pass. But I had lunch there recently, and that meal was so good that I know Thansgiving will be spectacular. The ambiance is homey, like being in a farm kitchen, because Summer Jo's is a farm. Almost everything you eat is either grown or made there. Even the bread flour is ground from estate-grown hard red wheat. You can hear the the bustle of pots and pans in the open kitchen, as if mom were cooking. Bright printed towels hang up high there, more for decoration than for use, I guess. And cheery, apple-printed cloths cover the tables. But the food isn't simple, hearty country fare, even though it's served in a white frame farmhouse. Plates are decorated with flowers grown on the farm. 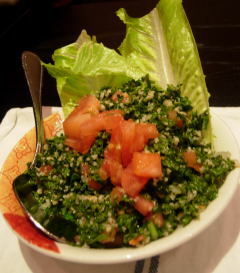 The greens, vegetables, fruits, grains and herbs are cultivated there too. And everything is organic. If it isn't produced on the farm, it is locally sourced, such as organic blue- and brown-shelled eggs and grass-fed beef. My salad combined farm-raised arugula, goat cheese and wild huckleberries in a citrus vinaigr ette. The crusty sourdough bread, with an olive here and there, had been naturally fermented. I could have followed that with fresh crab Benedict, an avocado, lettuce and tomato sandwich on multigrain bread with romesco aioli or a free-range beef burger with house-made pickles, chipotle aioli, Tillamook cheese and thick-cut French fries. But I chose crusty, tender, Washington State halibut in a sweet and sour ginger sauce. On the side were small thin pancakes embedded with green onion strands and an assortment of vegetables--zucchini, peapods, yellow squash, carrots and broccolini. And a little purple flower on top. Summer Jo's is known for its long, well-rounded wine list. With lunch I had a Kings Ridge Pinot Gris made with grapes from the Willamette Valley in Oregon, a cool growing area where this varietal does well. One dessert was the house brownie with Chantilly cream. How could I resist that? But I did, and chose apricot-cherry bread pudding with house-made caramel sauce, Prepared with Summer Jo's bread, it was as luscious as I had guessed that it would be. Summer Jo's Thanksgiving dinner will start with Dungeness crab gougere and butternut squash soup with toasted pumpkin seeds. Next is a salad of farm-raised greens with pears, pomegranate seeds and toasted walnuts. And then a lemon verbena sorbet. The main dish will be traditional roast turkey or beef Wellington or vegetarian cannelloni, each accompanied by thyme and sausage stuffing, maple-roasted yams, buttermilk mashed potatoes and cranberry chutney. The four choices for dessert are Belgium chocolate pyramid, creme brulee, a ginger pecan pumpkin tart and apricot bread pudding. Deciding among those would be next to impossible, so perhaps it's a good thing that I can't be there. But if you want to go, contact the restaurant at www.summerjo.com. Summer Jo's is located at 2315 Upper River Road Loop, Grants Pass, OR 97526. Tel: (541) 476-6882. How could a woman possibly dine out (that’s dine, not eat) without a classic Chanel handbag and its slightly curved “smile pocket” designed to hold tips? I'’ll manage somehow, because the black Chanel bag that I looked at was $2,800, slightly beyond my budget. I saw it at Tysons Galleria during a four-day wine and dine tour headquartered in Fairfax County, Virginia. The galleria opened into my hotel, the Ritz-Carlton, Tysons Corner, which saved me a walk outside in steamy summer heat. Cool and spacious, this luxury shopping center boasts the highest of high end boutiques, such as Chanel and Versace, where mimosas, cookies and chocolate truffles were set out the morning I stepped inside. That’s my kind of shopping. But I had other things to taste, such as Virginia wines. Yes, Virginia, there is wine in Virginia, a lot of it--153 wineries so far and another 10 set to open by the end of summer. I tasted astonishingly good Viognier and Petit Verdot, two varietals that thrive in this state. And I brought home two bottles that intrigued airport security inspectors so much they broke into my suitcase. No harm to the bottles, but the suitcase is finished. My hotel was only 15 minutes from Dulles airport. And wine country was close by. I was able to visit both Pearmund Cellars Winery and The Winery at La Grange after lunch and get back in plenty of time for dinner (great Italian food at Dante Ristorante in Great Falls). If you’re on too tight a schedule for wine touring, there’s an easy solution. Go to Vinifera Wine Bar & Bistro at the Westin Hotel in Reston Heights. The hotel opened in May and is so spanking new that carpet was still going down in the wine bar as I walked in for lunch. Vinifera offers more than 275 wines, including 30 or more by the glass, as well as sommelier-level advice on what to choose. The food is interesting and very good. 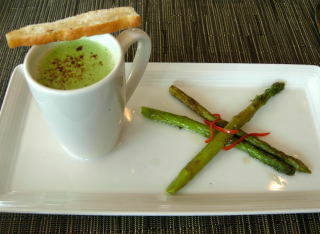 I had delicious citrusy tuna tartare and the richest, creamiest asparagus soup imaginable, accompanied by grilled asparagus stalks. Vinifera provided my only taste of Virginia ham on this trip, thin slices tucked into brioche bread along with herb cheese and a sweet Port and fig spread. The wine: a 2007 Virginia Pinot Grigio from Barboursville Vineyards. 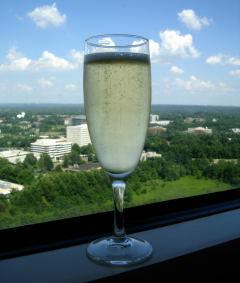 Because I was booked into a luxury hotel, I took along pearls and dressy outfits only to find that sporty casual clothes were fine--even when I went to the Ritz-Carlton’s exclusive 24th floor club for late afternoon champagne (Perrier Jouet Grand Brut). From this vantage point, I could see the Washington Monument—a tiny pale spike rising out of greenery stretching to the horizon. I haven’t seen so many trees since I was in Kerala in south India, where coconut palms blanket the land. Dinner in the Ritz’s Maestro restaurant was as elegant as one would expect from a place that has seen $1,000-a plate private events. Maestro is undergoing a redesign and will reopen in the fall with a new name and concept. 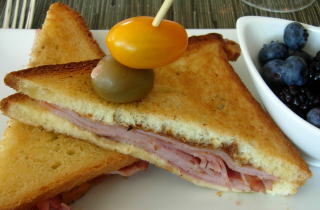 Hotel guests can still eat breakfast and lunch there until Labor Day. After that, construction begins. Our dinner, therefore, had to be specially arranged. And it merited Maestro’s full glamor regalia—tablecloths with shimmering gold stripes, Versace butter plates. The open kitchen was empty. The food was prepare d elsewhere in the hotel. 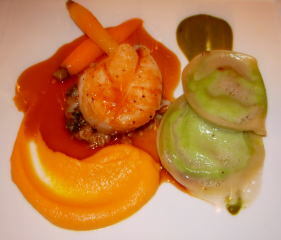 Dinner started with a single fat Georges Bank sea scallop accompanied by English pea ravioli with sorrel jus on one side and sweet potato sauce on the other. The wine: 2004 Riesling Grand Cru Schlosberg, Ehrhart, from Alsace. More seafood came next--a small square of Kona kompachi (yellowtail from Hawaii) on spinach caviar, accompanied by a Pinot Noir reduction and carrot sauce. The wine was 2006 Cristom Jefferson Vineyard Pinot Noir from Oregon. Wagyu New York strip arrived on an aqua glass artist’s palette with faux paint indentations that held the accompaniments: bearnaise sauce, meat jus, creamed spinach, asparagus and mushrooms. What else to eat with this but Parmesan truffled French fries? Our wine was Cinque (a combination of five varietals) from Puglia/Abruzzi. A pretty pink late harvest wine, Graticcio, Scubla, Verduzzo 1997 from Friuli accompanied an all-blueberry dessert—cheesecake, sorbet and compote. No wonder that the next morning we reported to the hotel spa to recover with a massage, followed by breakfast beside the pool. During the tour, we not only ate, we cooked. 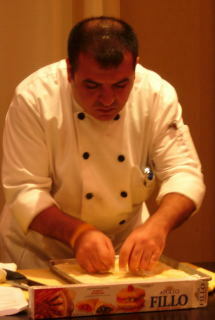 Knives and cutting boards were set at each place for a cooking class at the Lebanese Taverna in Tysons Galleria. Chef Mohamad Abdallah taught us to make the taverna’s signature hommos, stuffed grape leaves, tabouleh salad and the lightest baklava I have ever encountered—vegan baklava, laden with pistachios. 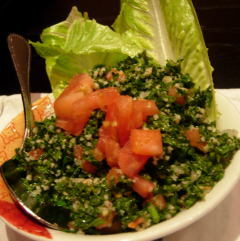 As we studied, we nibbled on meat-stuffed pastrie s, tabouleh, kibbeh, creamy eggplant and wonderful grilled lamb. 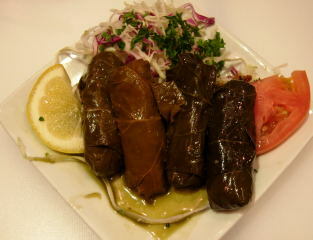 The taverna claims to be the largest user of lamb on the East Coast, but it is also known for vegetarian and vegan food. The only event at which I was overdressed was a concert (Gladys Knight) at Wolf Trap. Accustomed to the Hollywood Bowl, where one shivers as soon as the sun goes down, I too k along a shawl. Just carrying it was torture on such a hot, humid night and marked me as an ignorant tourist. The Hollywood Bowl may have more comfortable weather, but Wolf Trap has a better place to eat—Ovations restaurant. It’s a jolly, open air, casual place topped wit h a tent-like roof and ceiling fans. An 80th birthday party was in progress at the table next to mine. The buffet ($28) looked good, but in the heat I settled for a single dish, oven-roasted salmon on truffled polenta, topped with a kalamata-studded fennel and orange salad. The wine: Ste. Michelle Riesling 2007. Six fat chocolate-coated strawberries placed in my room that evening enabled me to last until brunch the next day—on the Potomac. 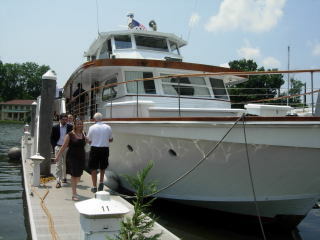 We cruised on Finished Business, an 85-foot charter yacht converted from a naval patrol vessel built in 1947. 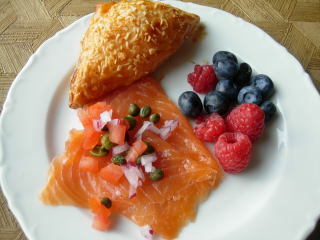 And we brunched on salad, fruit, pastries, blintzes, quiches and a hearty egg and sausage casserole, prepared on board. In the spring, when the cherry trees are in blossom, the yach t offers afternoon tea cruises. It’s a smooth ride, no seasickness, no wobbly legs. We docked after two hours, and took a quick drive through Georgetown. I was impressed by the large number of ethnic restaurants there—Ethiopian, Indian, Vietnamese, Japanese, Mexican and more—my kind of food. Investigating these will take another trip. At this point, the only trip I had time for was a ride to the airport for my flight home. The Ritz-Carlton, Tysons Corner, 1700 Tysons Blvd., McLean, VA., 22102. Tel: (703) 506-4300. Tysons Galleria, 2001 International Dr., McLean, VA 22102. Tel: (703) 827-7700. The Winery at La Grange, 4970 Antioch Road, Haymarket, VA 20169. Tel: (703) 753-9360. 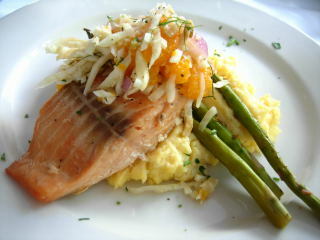 Dante Ristorante, 1148 Walker Road, Great Falls, VA 22066. Tel: (703) 759-3131. Vinifera Wine Bar & Bistro, Westin Reston Heights, 11750 Sunrise Valley Dr., Reston, VA 20191. Tel: (703) 391-9000. 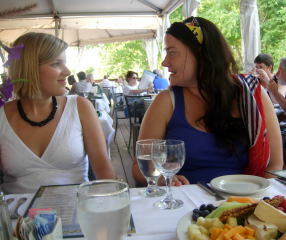 Wolf Trap (Ovations Restaurant), 1645 Trap Road, Vienna, VA 22182. Tel: (703) 255-1906. Capital Yacht Charters (Finished Business), 1300 Maine Ave. Southwest, Washington, DC 20024. Tel: (202) 554-0677. For more information on travel in Fairfax County, Virginia, go to www.fxva.com. From the top, Dinner at Maestro in the Ritz-Carlton, Tysons Corner; Virginia wine grapes; tuna tartare and a Virginia ham sandwich at Vinifera Wine Bar & Bistro; afternoon Champagne, a sea scallop and pea ravioli plate and breakfast choices at the Ritz-Carlton; Chef Mohamad Abdallah of the Lebanese Taverna makes baklava; the taverna's stuffed grape leaves; diners at Wolf Trap; Ovations restaurant salmon; Finished Business charter yacht.